US economic growth estimates for the third quarter have been trimmed in recent weeks, but most analysts are still projecting a solid rebound. If the predictions are correct, output is on track to expand at the strongest pace in two years when the Bureau of Economic Analysis publishes the “advance” report for Q3 GDP next month. The Wall Street Journal’s mid-September survey of economists, for instance, reflects an average growth rate of 2.9% for Q3. If correct, the US economy will rise at the strongest rate since 2014’s third quarter, when real GDP increased a sizzling 5.0% (seasonally adjusted annual rate). A rebound in economic activity for Q3 would mark a clear break from the roughly 1% growth rates in each of the previous three quarters. The last official GDP report covered Q2, which posted a tepid 1.1% advance. Current forecasts, however, anticipate that the government’s official Q3 data, scheduled for release on Oct. 28, will deliver substantially firmer results. It’s encouraging to see that the econometric estimates from two regional Fed banks align with the upbeat survey data. 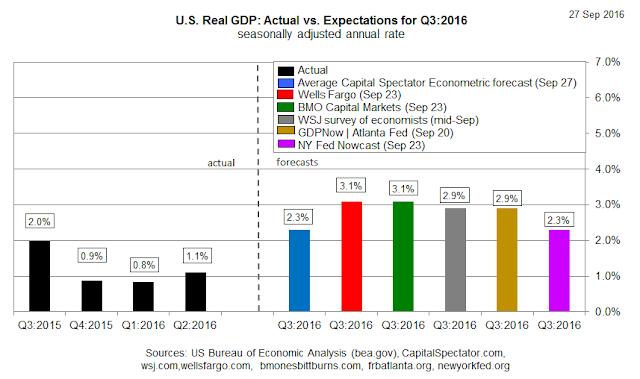 The Atlanta Fed’s GDPNow estimate (as of Sep. 20) projects Q3 growth at 2.9% and the New York Fed’s Sep. 23 nowcast is 2.3%, the latter estimate matching The Capital Spectator’s average GDP projection (based on several econometric estimates). The risk, of course, is that the incoming data between now and Oct. 28 skews weaker and drags down the Q3 projections in the weeks ahead. On that note, this Friday’s August update on personal income and spending is expected to reflect softer growth vs. July (based on Econoday.com’s consensus forecast). 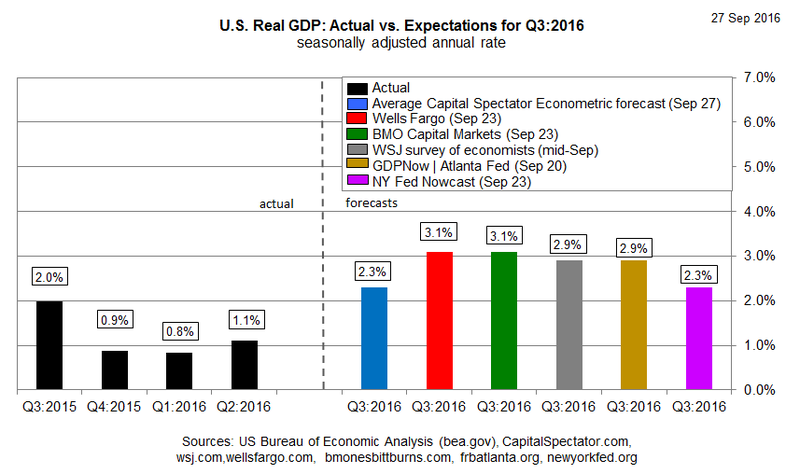 The downside bias implies that that the next round of GDP estimates could tick lower. Note that last week’s August update of the Conference Board’s Leading Economic Index (LEI) fell 0.2% last month. Nonetheless, the “trend still points to moderate economic growth in the months ahead,” says Ataman Ozyildirim, the Conference Board’s director of business cycles and growth research. Meantime, recession risk remained low through August and near-term projections continue to point to a stable macro climate that supports the case for anticipating moderate growth. But as last month’s reading of the Chicago Fed National Activity Index revealed, US growth remains subdued based on the numbers published to date. For the moment, however, there’s a reasonable case for expecting something better in the Q3 GDP data. But with another month to go before the official report arrives, the crowd is wondering if the next batch of reports–including next week’s employment report for September–will take a bite out of the optimistic projections.